When the Americans took over the Philippines (together with Puerto Rico and Cuba, and a few minor islands) from Spain in 1898, the U.S. suddenly became a colonial power in some parts of the world they knew very little about. After the destructive Philippine-American war, many archives were purposely destroyed, and little information was available. To complicate things further, those documents that were available were scattered around the world, and mostly written in Spanish. Under the editorship of Blair and Robertson, a massive 55-volume set was produced between 1903 and 1909. Under the title The Philippine Islands: 1493-1898, these volumes contain nearly 20.000 pages of historical documents and books translated to English and provided with notes and introductions. Even today, these books are indispensable for serious students of Philippine history. Unfortunately, the original set is extremely difficult to obtain (I located only one offered for sale at USD 8,400 or nearly half a million pesos), and even later reprints will cost several thousands of dollars. 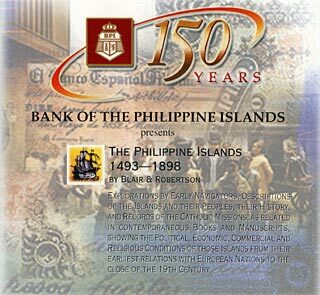 To remedy this, and to celebrate their 150th birthday, the Bank of the Philippine Islands reissued the entire set on two CD-Roms, to be distributed to selected schools, and to be sold to the public for 1,730 pesos, which places the set within reach of many. On the CD-Roms, you will find scans of each page of the set, conveniently stored in an Adobe Acrobat (PDF) file per volume, complete with a table of contents and hyperlinks for easy navigation. The page are in general clearly scanned, although a few have scratches or are slightly blurred, and many are slightly slanted. I haven't seen unreadable pages yet. The CD-Roms also include an installer for the Acrobat Reader (4.0), if you do not happen to have it installed yet. A missed opportunity is that you cannot do full-text searches. This would have been fairly easy to achieve using OCR software, and storing the text behind the page-images, such that the imperfections of OCR would not be visible. Overall, it is great to have these works available again, and the easy to use format is worthy of emulation. It would be great to have, for example, the volumes of the Census of the Philippine Islands available, the numerous anthropological studies made in the early part of the twentieth century, or a complete run of now difficult to obtain early Philippine magazines and newspapers. The CD-Rom can be ordered on-line from www.myAyala.com for PHP 1730, and from www.defensor.org for USD 49. Both charge outrageous shipping costs to international destinations, so prepare to have somebody receive it in the Philippines, and forward it to you. A few pages (about 15) are missing on this CD-Rom. Since that can be quite frustrating if you're studying a certain subject, I've asked somebody to scan these for me. If you want them, please contact the me. I am currently working to convert all volumes (except for the index) into searchable text using OCR and distributed proofreading (your help is most welcome! ), but that will take an estimated two years to complete. The finished volumes can be found, in easy readable text format, in our library. Recently, all volumes of Blair and Robertson, together with thousands of other volumes on the United States colonial period have been placed on-line by the University of Michigan, as part of their The United States and its Territories website. You can read the works on-line, and, even better, search through the entire collection at ease. The books are all presented as page-images. When you arrive on the site, search for "Blair" to find the 55 volumes. Gutenberg was able to convert to text the BR (unfortunately volume 1 to 24 only). BPI BR CD is not searchable. I have already prepared a scanned searchable copy of the BR (in pdf format) tho it will take several more weeks to bookmark all the 55 volumes. All scanned images came from University of Michigan website. Please email me if you want a DVD copy. It was myself putting those volumes in Project Gutenberg, and I intend to have all volumes, except the index available in future.--Jeroen. It was a great idea to save this immortal work on a CD! (I wonder if just one CD is enough???) TKS! I need it badly for my research work, as I live far from both Pinas and USA - I'm from Russia! :(( How can I obtain this CD? The CD could be ordered from the Ayala online shop, but are expensive, and somewhat defective (even more than I indicated above: so far I've located about 50 pages missing, wrong, or unreadable). Two other options: I've already converted to text the first 25 volumes. They are now available on-line in Project Gutenberg. All volumes are also on-line on at the University of Michigan, mentioned above.--Jeroen. Read all 15 comments by readers. your comments on "Review of The Philippine Islands: 1493-1898 by Emma Helen Blair and James A. Robertson (CD-ROM)"
This article has been viewed 264 times.